The half-term holiday is almost over and, for many students in their final year of school, university applications are high on the agenda. So, you’ve chosen your preferred courses and universities and started to fill in your personal details, education, qualifications and details of any paid jobs. So far, so straightforward – but here comes the awkward bit: The personal statement, required from everyone applying to university through the Ucas admissions service, is a major source of angst. Personal statements are written, rewritten, scrutinised by parents and teachers and rewritten again, taking up at least as much time and effort as any other piece of work this term. “It’s your chance to describe your ambitions, skills and experience,” says Ucas on its website. “Try to stand out but be careful with humour, quotes or anything unusual – just in case the admissions tutor doesn’t have the same sense of humour as you. Alex Hayman, managing director of Which? University tells would-be undergraduates their personal statements are “a key opportunity for you to showcase your individuality, knowledge and experience”. Your personal statement could “make the difference when it comes to receiving an offer from a university”. No pressure then, and it’s particularly tough if you are the first person in your family to apply to university. Even Ucas admits: “It’s scary”. Which? 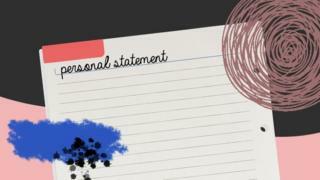 has launched a personal statement builder to help applicants write their first drafts. Alex Hayman says it’s crucial for statements to be “reflective and, importantly, personal” and he has highlighted seven ways to convince the admissions tutor to offer you a place. “Your personal statement is your opportunity to demonstrate to an admissions tutor that you are serious about higher education. “Show your understanding of what studying a degree would entail by demonstrating your awareness of the pressures and commitment needed – and your readiness to see the degree through,” says Mr Hayman. “Demonstrate you are the right candidate for the course and university by not only showing that you meet the entry requirements, but that you also have a strong grasp of, and engagement with, what studying this discipline at degree level entails. 3 – What interest in the subject can you show outside the classroom? “It’s important to display an interest in the subject outside your current syllabus. This could be further reading around the subject – but anything from podcasts, periodicals, exhibitions or performance could also help. 4 – Explain why you chose this subject and course – and how will you cope? “What are your motivations for applying for this course? Why did you decide this is the right one for you? And if it’s something you haven’t studied before what strengths will help you cope? Give examples of these in action. Are you good at working independently, teamwork, problem-solving or leadership, for example? “Regardless of subject, studying at degree level is all about thinking independently and analytically. 6 – What if some of your grades are disappointing? “Don’t let a disappointing GCSE (or, in Scotland, National 4) performance automatically put you off applying to the university course you really want. “If you haven’t got the best results then it will be important to demonstrate your academic ability through your predicted A-level grades (or other advanced-level qualification, such as BTECs) and your passion and determination in your personal statement. Take time to research course entry requirements, says Alex Hayman of Which? “However, regardless of the subject you want to study, the majority of university courses look for at least GCSE C grades in English maths and perhaps science – that’s grade 4 or 5 under the new structure. “And some of the more competitive universities will ask for very high A-level grades for most subjects – and an equally strong set of GCSEs. 7 – Explain how the course will help towards your long-term plans? “Don’t worry, there’s no pressure to have your future mapped out quite yet – but do include any ideas on how your degree might help you in the next step towards any plans or career goals. Applications for most university courses starting in 2018 are open until January 15, though the deadline for some art and design courses is March 24.